In this week’s match-up we take a look at Melbourne Heart FC stand-in captain Rob Wielaert and his Brisbane Roar counterpart Matt Smith. 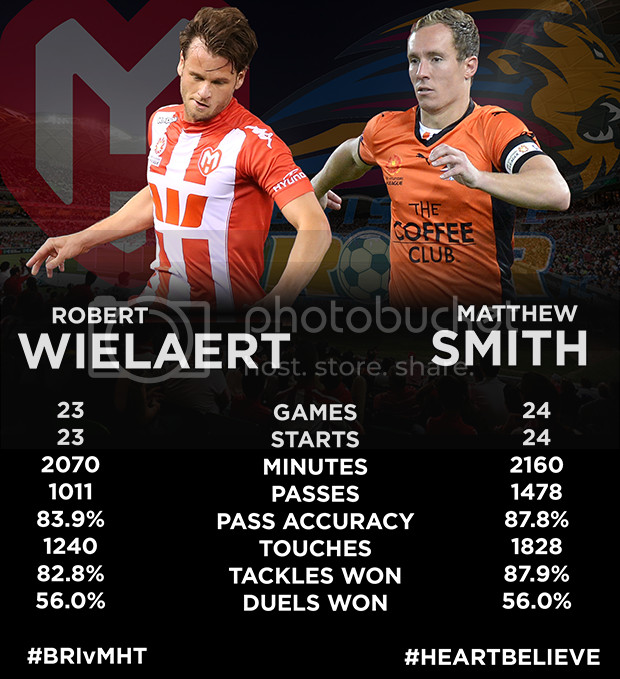 In this week-s match-up we take a look at Melbourne Heart FC stand-in captain Rob Wielaert and his Brisbane Roar counterpart Matt Smith. Wielaert was signed in the off-season by Melbourne Heart and has played for big-name clubs in Holland including FC Twente, Ajax Amsterdam and PSV Eindhoven. The Dutch central defender has made a total of 23 starts in the 2013-14 A-League season, with the only game he missed coming the last time these two sides met last month in Heart's 1-0 win at AAMI Park. Brisbane Roar captain Matt Smith has played every single minute of Brisbane Roar's season so far, in which they clinched the premiers plate last Saturday night. Smith has been one of the best players in the competition this season, and his statistics reflect that. The Socceroo has also popped up with three goals so far this campaign. Smith has amassed the third most touches of the ball in the league this season, behind teammates Thomas Broich and Luke Bratta, with 1828. He has the second most passes though, behind Broich again, with 1478 passes attempted. Wielaert has the third most touches in the Heart squad with 1240, while he sits second in the side in the passes attempted stat with a total of 1011 so far this season. Wieleart's passing accuracy is at 83.%, while Smith's is a club high 87.8%. Smith and Wielaert have identical figures in the percentage of duels won category with 56%. Smith has been involved in more duels though with 207 compared to Wielaert's 141. Smith dominates the clearances category with 187 over Wielaert's 108. The two have a high tackles won percentage, with Wielaert posting a total of 82.% compared to Smith's 87.9%. Wielart missed the last clash between Heart and Roar after picking up his fifth yellow card of the season, but the defender has not gone in to the book since. Smith has four yellows so far this campaign and a fifth will see him suspended for one match. Click here to see all the facts and figures for tonight's Brisbane Roar vs Melbourne Heart FC clash.